Look closely. You’ll see two dark lines. The very light one at the bottom is the original sand. This Saturday, we took our friend Chip to the dump. Dumps are weird places. I find them both fascinating and unsettling, probably because I reuse so much and find throwing away useable items hard to accept. Still, dumps are necessary. It’s pretty hard to reuse water-sodden siding or window blinds so old that they’re crumbling, both of which were among the things we were helping Chip get rid of that day. This trip, I was pleased to discover that the dump had separate bins set up for old electronics. An attendant came over to ask if our load included any metal. Good to know that even the dump is getting into recycling and reusing. Not everyone is so conscientious. At the bay next to us, a man in a huge, shiny pick-up truck was unloading what looked like the remnants of an office, including several three-ring binders that certainly could have been emptied and sorted out. Two bays down, a panel van was unloading at least a dozen toilets, sending them to crash into fragments on the pavement. I hope these were older, high water-usage models. Even so, I couldn’t help but think that Mira in Child of a Rainless Year or the Head Wolf’s pack in Brother to Dragons, Companion to Owls could have found uses for this stuff. Across from us, two other bays were filled by trucks dumping branches and leaves. These particularly bothered me because the leaves could have easily been composted and most wood can be chipped and used for mulch. My own yard generates an amazing amount of organic “trash” – especially given that our largest tree is an apricot – a complete light-weight in the department of producing leaves. Still, we have large amounts of wild asters (we let them go for the lovely display of purple flowers in the autumn), sunflowers (both wild and domestic), wild mallow, and various bunch grasses. We also collect the leaves from our neighbor’s mulberry tree. All of this goes into trenches we dig in our vegetable beds. You see, the basic material of our yard is sand. Not sand and trace matter: sand. Great drainage, but lousy nutritive value. When friends of ours with horses lived closer, we would collect manure from them. Lately, we’ve depended almost exclusively on the organic matter in our compost trenches. 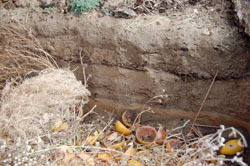 When visitors see these trenches – they’re a good five feet long, about three feet wide, and easily that deep – filled to the brim with dead plants, wood chips from our guinea pigs’ bedding, and other organic waste, they can’t believe that by the next year all that will be left is an inch-thick strip of dark, crumbly earth. But, from experience, I know that’s what will be there. For a writer, a life lived actively can become like organic matter dropped in a trench, covered over with soil, and left to rot. Something read years before may provide a story idea, as it did for me when an article about how historic lighthouses are often moved to preserve them became the root for the story “It Must Burn” in the anthology Lighthouse Hauntings. This past weekend we went to the dump with our friend Chip. The experience is there, a thin line of dark soil in the compost trench of my mind. Last Saturday, Jim and I went to the Adobe Theater to see Shakespeare’s Twelfth Night. The prompt for this outing was because our friend Rowan Derrick (one of the Los Alamos Five, for those of you who read the acknowledgments in Wolf’s Head, Wolf’s Heart) was playing the role of Olivia. Tori Hansen, another member of that exclusive cabal, was the Lighting Designer. We may have gone to see our friends’ artistry at work, but we ended up enjoying the production on its own merits. The acting was excellent – especially for an amateur production. The level of experience among the actors started with a complete novice, moved to a very sophisticated thirteen year-old, and included both a long-time high school drama teacher and a sometime film actor. Oddly enough, this mingling of levels of experience added to our pleasure and stimulated much conversation thereafter. Before we attended the play, Jim had asked me if I knew why it was called Twelfth Night. I’d been wondering the same thing (a lot of years have gone by since I’d last read the play), so I went and looked it up. It turns out that Twelfth Night has dual significance. First, it was the last day of the church Christmas calender, the Feast of the Epiphany, which commemorates the visit of the Magi to the infant Christ Child. Secondly, and more appropriate for the play, in Shakespeare’s time, Twelfth Night was also celebrated as the “Feast of Fools,” a time when the ordinary rules of society were abandoned or inverted, permitting cheerful chaos to reign. Therefore, Twelfth Night or What You Will (this is the only one of Shakespeare’s plays to have an alternative title) is a play about expectations turned upside down and inside out. After we’d seen the play, Jim and I discussed how well the title fit the action. He was probably ready to let go of the subject after that. However, I wasn’t. Possibly one of the greatest joys – or deficits, depending on your point of view – of being a writer is that once a story grabs hold of you, it’s very hard to leave it alone. Therefore, the next morning, hardly before his coffee was in him, poor Jim was subjected not only to my assessment of how Shakespeare’s play could be reinterpreted (with a special emphasis on the theme of inversion), but also to a thumbnail sketch of a sequel to the play based upon this reinterpretation. No. Don’t worry. I’m not going to go into all of that here. It would take quite a while. Anyhow, maybe one of these days, I’ll write it. Starting on January 20th, I’ll be making weekly posts to this site. They’ll be about whatever has caught my fancy, especially the odd stuff I see as I go about my day. Maybe they’ll provide some insight into how one writer thinks. Hopefully, they’ll be amusing. Join me on January 20, 2010, and we’ll all find out.